Galen: Could Loblaws buy Heinz’s discarded Leamington plant? Pre-reading NOTE: Work has taken me to SW Ontario a great deal this year, so Heinz announcing the closure of its Leamington, Ontario, operations stuck in my head. Another warning, I am gearing up the for winter semester and back in MBA “shared value creation” mode. Apparently, Heinz’s announcement to close a Canadian plant fits into a cost-cutting strategy that will bring more production capacity (and jobs!) to its U.S. operations. I am sure the “business case” is rock solid and we can’t expect a profit-motivated U.S. corporation to care about tomato farmers in Canada, can we? But can we expect a profit-motivated Canadian corporation to care? Any other off shoots that create value for a distinct group. It would take a good deal of analysis to look at how this could work and there may be some obvious things that I am missing due to lack of expertise. One thing that hangs up such ideas is how to account for the various kinds of value it creates. This entry was posted in Uncategorized on December 6, 2013 by chris493. The BBC published an article on Abraham Maslow this week describing the impact of the hierarchy of needs that bears his name. Any social psychology or organizational behaviour course will touch on this in trying to explain the motivators and needs that have people do what they do. NOTE: If you don’t subscribe to the “purpose need” theory, you debunk this whole line of thought. People want money; pay them and they work. Pay them more and they work harder. We will address this later. The results were not unexpected. At the leadership level of the organization, the “purpose need” appears to be fulfilled: one third report that the purpose is “obvious” and more than half say people could find it in different ways. Further down the organization, the results are opposite. The number of people who report being “here to work” (e.g. absence of purpose beyond Maslovian survival) grows to one-third at the middle-tier level, and to more than half at the lowest levels of the organization. One explanation for employees not taking the opportunity to be more invested, involved, and engaged with their work is that the organization is not being clear or consistent enough about how their work matters. For a moment, let’s put the onus on leadership to declare a preference for the kind of success they will pursue. Yes, we want to be profitable, but our self-imposed constraints (e.g. constraints we select not restrictions/rules to which we comply) reveal what matters most and may embody one’s sense of purpose. Do any of these “commitments” sound familiar? The internal audiences will be most attuned to inconsistency because they will see (or suspect) what really drives decisions and what lines a being stretched or crossed. Inconsistency is a breeding ground for cynicism and could be a reason for disengagement such that you report being “here to work.” The rubber hits the road when an organization takes a decision consistent with a “commitment” and appears to forego profit maximization in the short-term. If your organization is poised-to grow, would investors or shareholders support such a commitment? If you are competing for talent, would good employees reward you with loyalty? If you are competing for funding dollars, could this build your credibility with foundations and with public sector funders? In all cases, there will be some important parties who don’t agree or don’t care. The better question is “Would you get enough support for you to succeed?” and “What could you do to gain the support of those who need to see results?” Selecting the right measures and delivering results will be fundamental to your success. Stay tuned for the next post where we shift the focus to the rank-and-file responsibilities. This entry was posted in Clarifying the Story, Performance Measures & Scoring and tagged Alignment Survey 2013, BBC, Leadership, Maslow, Rules and Ethics, Social Impact on September 5, 2013 by chris493. This article appears in the August 2013 newsletter for the Canadian Supply Chain Sector Council (supplychaincanada.org). Below, we share some of the insights and will continue to release findings on this website. Our underlying thinking is that performance-driven collaboration has a great chance of happening naturally when the parties (1) share a view of what they want to achieve and (2) agree upon the indicators of whether or not they are making progress. Note: Our consulting approach can help you navigate Questions 1 and 2. For Question 3, we are happy to hear you out, but soul searching is often an individual endeavour. We asked people to report the degree to which they thought the overall direction was clear to them and others. The clarity rises as you get further up the org chart. But, you knew that. It is simple. The not so easy part is how can you acknowledge some ambiguity in the overall direction, but make it clear enough that people can maintain congruent priorities. Have a look at two different reasonable explanations here . The survey gathered information on how decision-making fits in with collaboration, and the interplay between the level of engagement with the organization and providing clear direction. Another simple insight emerged: When the perceived leadership style veered toward the top-down approach, people reported having conflicting inter-departmental priorities and succumbing to pressures to protect information. Again, the challenge here for leadership is to be able to provide compelling rationale for decisions, even in the face of reasoned disagreement. This necessitates clarity on the kind of performance the organization is pursuing and how that performance is being measured. We asked a question in regard to the extent to which colleagues were on the same page. 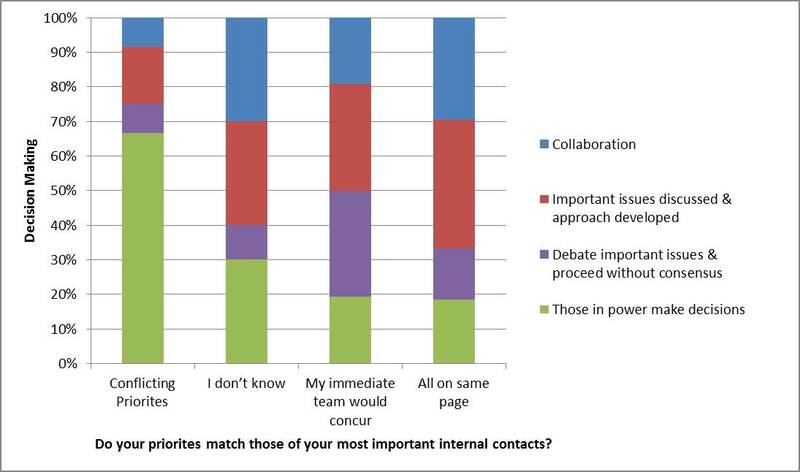 One third of respondents were evenly split between “I don’t know” and “priorities conflict.” The uncanny symmetry repeats with the remaining two-thirds equally split between “my immediate team concurs” and “we all concur”. We need profitability to drive innovation. A focus on employee safety firms up our value to clients, unions and funders. Efficiency means the right product in the right place at the right time. Close relationships ensure long-term success. What you believe starts the story and sets up whether you are in conflict, in cahoots or out-of-touch with colleagues and collaborators. It can be worthwhile to check in on how aligned personal views are with organizational direction. For the one-third that is sure that everyone is aligned: Good for you! For the one-third that is sure at least their group is aligned: Clarifying the fit with other groups and the wider effort will help align actions and reduce friction. For the one-third that is in conflict or unsure: Confirming the conflict can expose a strategic decision that can shape a shared view of performance. It is as simple as asking, but it is not easy to get good answers from the inside. This entry was posted in Uncategorized and tagged Alignment Survey 2013, Collaboration, CSCSC, Supply Chain on August 23, 2013 by chris493. There is an understanding that with authority comes the responsibility to make decisions. Personal style, organizational structure and corporate culture can encourage varying degrees of consensus building and collaboration, but the buck always stops somewhere. 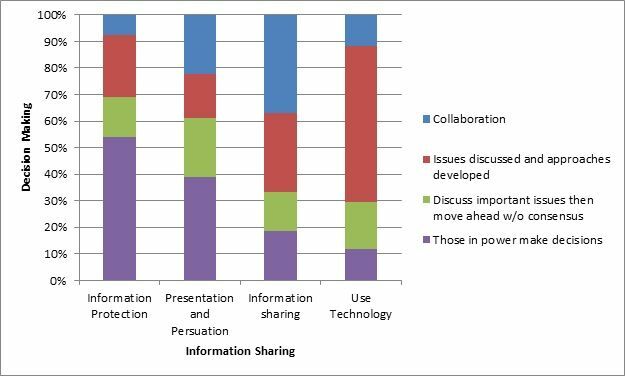 In our earlier survey we explored the extent to which such collaboration factored into decision making. Note: For the moment, we will ignore the very real issue of authority figures who simply refuse to make the tough decisions! A number of respondents felt that, in their organization, those in authority tend to make the decisions where important issues are concerned. This could mean adherence to a traditional top-down structure, but there are different ways to convey a decision from above. A savvy leader can walk into a meeting with their decision already made but create the feeling among others that the experience was very collaborative. A more straightforward leader (or leadership team) may adopt the tell-and-sell approach whereby they demonstrate the rationale that went into picking one side of a trade-off situation. From our survey results, a “blackbox” may be a more fitting metaphor for some such top-down organizations because priorities tend to conflict and information tends to be closely guarded. 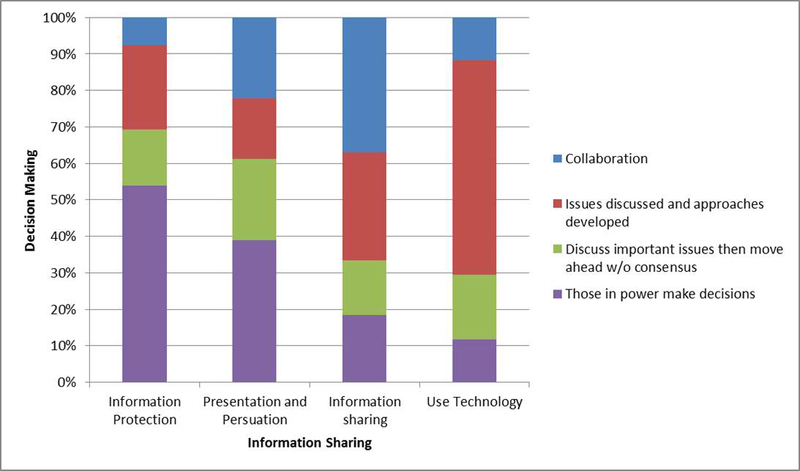 Based on our survey, of those who perceived a top-down decision structure, 2 out of 3 believed there were “conflicting priorities” and more than half also indicated that “information protection” was the communication norm. You can see how these connections can emerge: Department A operates under the marching orders that anything goes as long as we achieve Priority A. Department B feels the same way about Priority B. There is no clear guidance for either group (from leadership) about the impact on the overall desired performance. When a stalemate occurs, the boardroom fills up, the doors close and after some time a verdict appears. From outside the boardroom, this would resemble waiting for an instant replay decision to come down from the booth. That people communicate on a “need to know” basis is understood; it is akin to court proceeding where anything you say could be used against you. This is how the walls of the metaphoric silos emerge and thicken. External parties can get roped in to the drama resulting from internal efforts to curry favour with upper management. Suppliers, customers and partners may be sympathetic to the plights of their contact having to work in such a political environment, but revealing this level of in-fighting to an external party rarely paints the organization in a favourable light. Often times the task at hand is difficult enough to begin with, so why burden yourself with the additional strife from the internal squabbling or playing to the judges? “Pitch the idea to authority to gain compliance from others” is not a workable definition of collaboration in environments that need to take performance seriously. Training can make it worse (see below). The approach for newer organizations with respect to this particular problem may well be preventative. One of the characteristics of growth is the creation of different “departments” that must operate with a degree of autonomy. There is an opportunity early on to paint the connections within the wider organization so all departments are focussed on the same priorities and silos don’t develop as rigidly. We have found that requests for training in such areas as “making business cases” and “influencing” stem from an environment where a common understanding has not been allowed to take hold. Building communication skills in warring factions can deteriorate into a cold war of building persuasiveness. There may be an opportunity to build a common understanding by fleshing out the potential links between actions and desired results. This entry was posted in Clarifying the Story, Performance Measures & Scoring, Training the Right Things, Uncategorized and tagged Alignment Survey 2013, Collaboration, Leadership on August 15, 2013 by chris493.